The year is 2072. Magic has returned and creatures of myth and legend walk among us as megacorps bleed the world dry. You’re a shadowrunner—a deniable asset, a corporate pawn—using bleeding-edge science and magic to make your meat body and mind better-than-flesh. Stay on the edge, and you may survive another run on the mean sprawl streets. Shadowrun, Fourth Edition offers a completely new rules system that is simple, integrated, and accessible. The state-of-the-art has also been advanced, introducing a new level of augmented reality, new gear, and new magical discoveries. This full-color rulebook contains all the rules gamemasters and players need to create characters and ongoing adventures set in the popular Shadowrun universe. 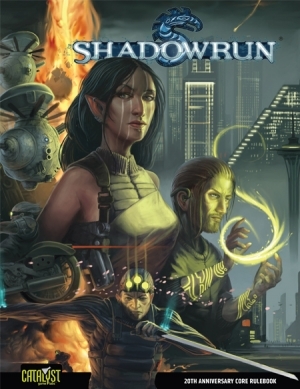 Shadowrun, Fourth Edition 20th Anniversary Core Rulebook is fully compatible with all Shadowrun, Fourth Edition books.